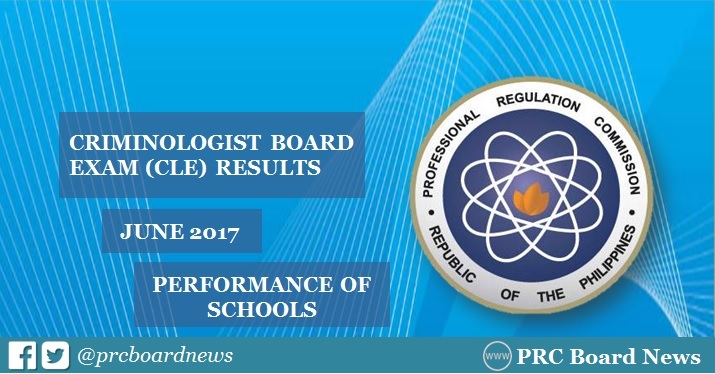 The Professional Regulation Commission (PRC) officially announces results of June 2017 Criminology board exam or Criminologist Licensure Examination (CLE) given by the Board of Criminology in the cities of Manila, Baguio, Cagayan de Oro, Cebu, Davao, Iloilo, Legazpi, Lucena, Pagadian, Tacloban, Tuguegarao and Zamboanga. PRC recognized University of the Cordilleras (UC) as the top performing school in the June 2017 Criminologist Licensure Examination as per Commission Resolution No. 2010-547 series of 2010: WITH 50 OR MORE EXAMINEES AND WITH AT LEAST 80% PASSING PERCENTAGE. In the April 2016 CLE, University of the Cordilleras (UC) topped the schools with 98.13% passing rate. Completing the top three (3) spots were Lipa City Colleges (91.94%) and University of Baguio (82.43%). UC also led the schools in the April 2015 examinations for having 100% passing rate. Lipa City Colleges (92.98%), University of Baguio (88.00%) and University of Manila (81.91%) are among the top performing schools.